Lee Bennett Hopkins is a pillar in children’s literature, having created and received several awards in his career. Here are some of his more notable achievements. 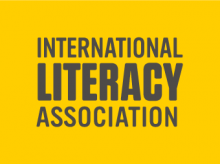 This article originally appeared in the May/June 2017 issue of Literacy Today, the member magazine of the International Literacy Association (ILA). It is shared here with permission from ILA. Click here to visit the award’s website. For full details, click here to visit the award’s website. 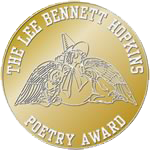 The Lee Bennett Hopkins Poetry award was established in 1993 and is presented annually to an American poet or anthologist for the most outstanding new book of children’s poetry published in the previous calendar year. It is co-sponsored by Mr. Hopkins himself, the Pennsylvania State University Libraries, the Pennsylvania Center for the Book, and an additional sponsor, Pennsylvania School Librarians Association. The winning poet or anthologist receives a handsome plaque and a $1000 honorarium. Click here to visit the Lee B. Hopkins Poetry Award Teaching Toolbox, a blog created and maintained by Sylvia Vardell. Click here to see a list of all award recipients on TeachingBooks.net. Click here to view a video from Lee commemorating the 20th Anniversary of the Lee Bennett Hopkins Poetry Award. The Lee Bennett Hopkins/IRA Promising Poet Award is given every three years to a promising new poet of children’s poetry (for children and young adults up to grade 12) who has published no more than two books of children’s poetry. For full details, click here to visit the award’s website. Lee Bennett Hopkins has written and edited numerous award-winning books for children and young adults, as well as professional texts and curriculum materials. He has taught elementary school and served as a consultant to school systems throughout the country. Born in Scranton, Pennsylvania, Mr. Hopkins graduated Kean University, Bank Street College of Education, and holds a Professional Diploma in Educational Supervision and Administration from Hunter College. In 1980 he was awarded an honorary Doctor of Laws degree from Kean University. The Catholic Library Association is excited to announce Lee Bennett Hopkins as the recipient of the 2016 Regina Medal Award. Lee Bennett Hopkins has written and edited numerous award-winning books for children and young adults, as well as professional texts and curriculum materials. He is a past winner of the Christopher Award, SCBWI Golden Kite Honor Book Award, NCTE Award for Excellence in Poetry for Children and was recognized by Guinness World Records as the world’s most prolific anthologist of poetry for children. The Award will be presented to Hopkins at the 2016 CLA Convention in conjunction with the National Catholic Educators Association Convention and Expo being held March 29-31, 2016 in San Diego, CA. The National Council of Teachers of English wishes to recognize and foster excellence in children’s poetry by encouraging its publication and by exploring ways to acquaint teachers and children with poetry through such means as publications, programs, and displays. As one means of accomplishing this goal, NCTE established its Award for Excellence in Poetry for Children in 1977 to honor a living American poet for his or her aggregate work for children ages 3-13. Lee Bennett Hopkins received the NCTE Award in 2009. For full details, click here to visit the award’s website, and click here for the award’s feature article on Hopkins. Lee Bennett Hopkins received the Christopher Award in 1995 for his autobiographical poetry collection Been To Yesterdays. For full details, click here to visit the award’s website. Instituted in 1973, the Golden Kite Honor Book Awards are the only children’s literary award judged by a jury of peers. More than 1,000 books are entered each year. The award is presented by the Society of Children’s Book Writers & Illustrators, and given annually to recognize excellence in children’s literature. Lee Bennett Hopkins received the Golden Kite Honor Book Award in 1996 for his autobiographical poetry collection Been To Yesterdays. For full details, click here to visit the award’s website. 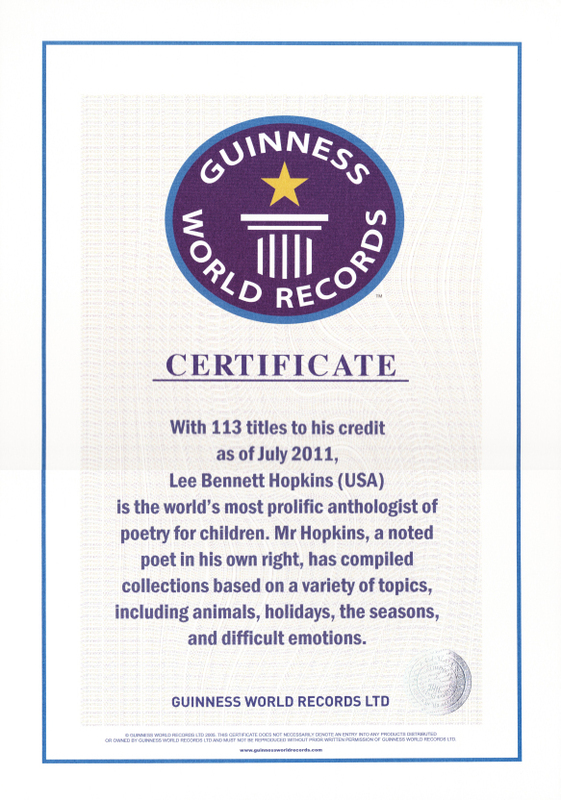 In July 2011, Lee Bennett Hopkins was recognized by Guinness World Records as the world’s most prolific anthologist of poetry for children, with 113 titles to his credit. Click here for Hopkins’ entry among the world’s greatest.